The "Golden Mile", Marbella's most prestigious area lies between Plaza Bocanegra, the western end of the city center and the Río Verde just before Puerto Banús. It is home to the 5* hotels Puente Romano and Marbella Club, fine restaurants, chic nightclubs, well-known beach clubs and excellent shopping. Alhambra del Mar is one of the most sought after residential developments on Marbella's Golden Mile. The urbanisation is located next to the Hotel Don Pepe and in walking distance to the Paseo Marítimo and to Marbella center. Surrounded by marvellous, price awarded tropical gardens with pool area and direct access to the beach. 24h Security and Gated Parking. Large property, located in one of the most sought after urbanizations "Alhambra del Mar" on the beachfront with direct access to the promenade. Located in a quiet area, a few minutes walk from the Golden Mile and the center of Marbella, and all kinds of services. Duplex-type, consisting of a large living room with more than 50m2, renovated kitchen with laundry area, two large bedrooms, with three bathrooms on the ground floor and nice terrace with sea views and southwest orientation. The upper part of the property has a large bedroom with bathroom en suite and dressing room, and a large terrace with private pool, wonderful views of the sea and the mountains with afternoon sun and morning sun. The property includes an underground parking garage. The property is part of an exclusive complex divided into several phases, with three communal swimming pool areas, large gardens and direct access to the promenade and the beach. 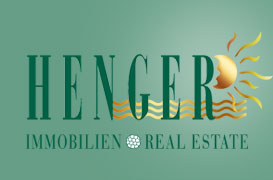 An ideal property, for clients looking for a large property, in the best location in Marbella. Beautiful apartment in one of the most sought after residential developments on Marbella's Golden Mile. The complex is located next to the Hotel Don Pepe and in walking distance on the Paseo Marítimo to Marbella Center. Marvellous tropical gardens with pool area and 24h security. The apartment is in immaculate condition and compromises large living/dining area, fully fitted kitchen with separated utility area, 2 bedrooms and 2 bathrooms, one of them en-suite. Ample, private terrace with south-east orientation and views to the gardens and pool. Air conditioning hot/cold, alarm system, gated parking, and 11 m2 storage. Beautiful mid-floor apartment in the fabulous Alhambra del Mar development - one of the most sought after and prestigious residential areas of Marbella's Golden Mile. Situated directly on the Paseo Marítimo, thanks to its location directly on the sea, it offers tranquillity as well as immediate proximity to the centre of Marbella with its picturesque old town. Everything is within walking and cycling distance. The Puerto Banus marina and the numerous golf courses in the area are only a few minutes away by car. The apartment features a spacious living-dining area with over 40 m2, two bedrooms (which could be easily converted into three) with en-suite bathrooms and a guest toilet. The sunny partly covered south-west facing terrace enjoys lovely views to the sea, pool area, tropical gardens and pine tree forest. Private gated parking. Beautiful apartment in first line beach complex in one of the best areas on Marbella´s Golden Mile. South-west facing. Spacious living/dining area with open amercian kitchen, fully equipped. The apartment has been completely refurbished to highest standards, e.g. underfloor heating and high speed internet. 2 large bedrooms with bathrooms en-suite. Large, south-west facing terrace with lovely views to the tropical gardens, to the sea and Puerto Banús. 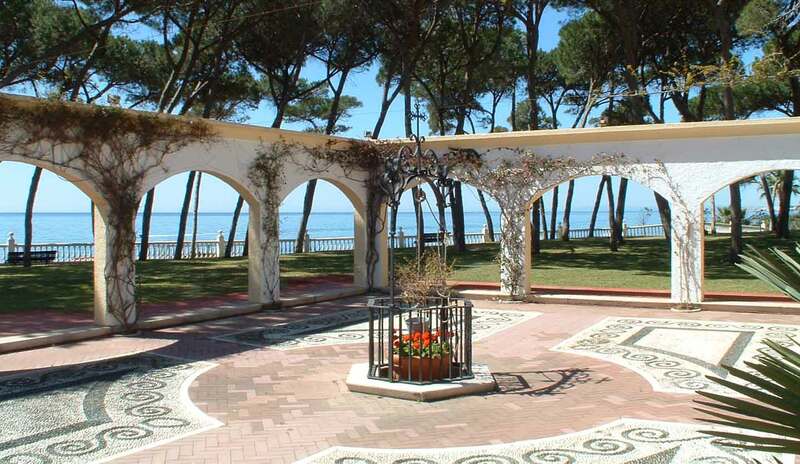 The complex has marvellous price awarded gardens with swimming pool area and direct access to the beach promenade. Beautiful apartment in one of the most sought after residential developments on Marbella's Golden Mile. The complex is located next to the Hotel Don Pepe and in walking distance to the Paseo Marítimo and to Marbella center. Marvellous tropical gardens with pool area and 24h security. The apartment is in immaculate condition and compromises large living/dining area, fully fitted kitchen with separated utility area, 2 bedrooms and 2 bathrooms, one of them en-suite. Part of the terrace has been converted into a small individual bedroom. Nice terrace with south-east orientation and views to the gardens and pool. 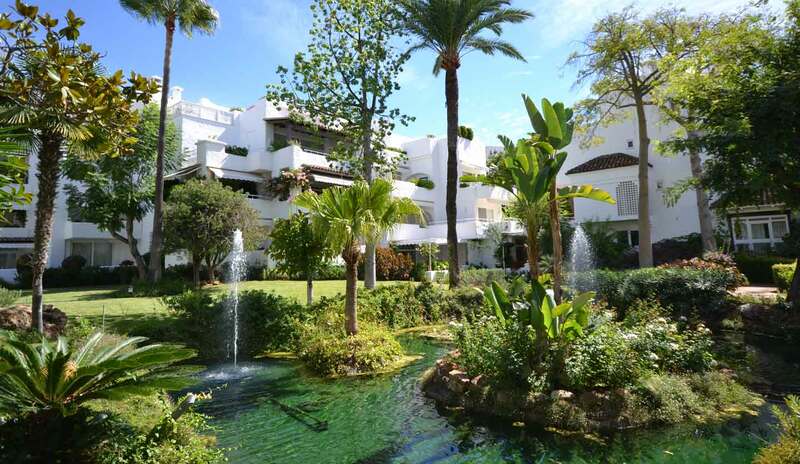 Luxury duplex-penthouse in one of the most sought after developments in Marbella. The urbanisation is right at the Paseo Marítimo, fronline beach. The penthouse offers splendid sea views. The ample living area on two floors consists of 3 bedrooms, 3 bathrooms, spacious lounge with open fire place, further lounge upstairs, fully fitted kitchen, private jacuzzi on the roof terrace (108m²), air conditioning warm/cold, garage, elevator to the garage, etc. Beautiful duplex penthouse in one of the most sought after residential developments on Marbella's Golden Mile. The complex is located next to the Hotel Don Pepe and in walking distance to the Paseo Marítimo and to Marbella center. Marvellous tropical gardens with pool area and 24h security. The penthouse compromises entrance hall, living/dining area with access to the sunny terrace with views over the gardens, fully fitted open american kitchen, 2 bedrooms and 2 bathrooms, one of them en-suite. On the upper level is the master bedroom with bathroom en-suite and a large terrace with south-west orientation and jacuzzi, plus a further terrace with north orientation. Separate, large utility room. The penthouse has been totally renovated and equipped throughout with wooden floor, heating all over the property and piped music system. Lovely beach front property with great sea views the heart of Marbella´s Golden Mile. Open Amercian kitchen. Spacious covered terrace with sauna. Southwest facing. Completely refurbished in 2010. Three bed room duplex penthouse on the golden mile of Marbella, very close to the beach (Paseo Maritimo), All bathrooms en suite plus guest bathroom. Private pool and terraces. All amenities within walking distance. The "Golden Mile", Marbella's most prestigious area lies between Plaza Bocanegra, the western end of the city center and the Río Verde just before Puerto Banús. It is home to the 5* hotels Puente Romano and Marbella Club, fine restaurants, chic nightclubs, well-known beach clubs and excellent shopping. Alhambra del Mar is one of the most sought after residential developments on Marbella's Golden Mile. The urbanisation is located next to the Hotel Don Pepe and in walking distance to the Paseo Marítimo and to Marbella center. Surrounded by marvellous, price awarded tropical gardens with pool area and direct access to the beach. 24h Security and Gated Parking. Completely, to highest standars renovated apartment in one of the most sought after residential complexes on Marbella's Golden Mile. Private parking.The beautiful complex is located frontline beach, next to the Hotel Don Pepe, and in walking distance on the Paseo Marítimo to Marbella Center. Beautiful, tropical gardens with pool area. The south-west facing apartment is an elevated ground floor and comprises large living/dining area, open fully fitted kitchen, guest toilet, 3 bedrooms and 3 bathrooms en-suite. Ample, private and sunny terrace with views to the gardens and some sea views. Direct acces to the garden and pool from the terrace. IMPORTANT: The general refurbishment and complete, luxurious new furnishing will be completed during the month of May 2019. Therefore, the corresponding photos can only be placed or submitted later. Bright, attractively furnished corner apartment with beautiful, spacious terrace right on the beach in "Alhambra del Mar", one of the most exclusive residential areas on Marbella's Golden Mile, within walking distance of the city centre and 150m away from the famous "Paseo Maritimo", the town's sea front. Spacious living/dining area in rustic style, tasteful and cosy. Large sliding doors to the terrace, that enjoys beautiful views of the beautiful tropical gardens. Perfectly furnished luxury apartment directly on the beach in one of the most exclusive residential areas on Marbella's Golden Mile. Completely renovated in 2018. Spacious living/dining area. High quality marble floors & bathrooms. 3 bedrooms, 2 with bathroom en-suite. Fully equipped kitchen. Large southeast and west facing terrace with stunning views of the tropical gardens, pool, mountains and sea. 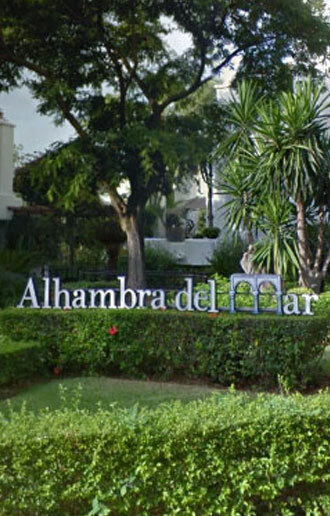 The urbanisation Alhambra del Mar is located at the Golden Mile of Marbella directly at the sea in a quiet location. The closed complex has one of the most beautiful gardens in Andalusia with idyllic streams, lily ponds and incomparable vegetation. The access to the beach promenade allows you to reach the centre of Marbella in less than 10 minutes. Numerous restaurants and shops are nearby. Beautiful apartment in one of the most sought after residential developments on Marbella's Golden Mile. The complex is located next to the Hotel Don Pepe and in walking distance to the Paseo Marítimo and to Marbella center. Marvellous tropical gardens with pool area and 24h security. The apartment is in immaculate condition and comprises large living/dining area, fully fitted kitchen with separated utility area, 3 bedrooms and 3 bathrooms, two of them en-suite. Nice terrace with south-east orientation and 100 sqm of private garden. Completely, to highest standars renovated apartment. Spacious living/dining area with open american kitchen. 3 bedrooms & 3· bathrooms. Large terrace, southeast facing, with lovely views to the tropical gardens and the pool area. It also has some sea views. Underfloor heating throughout the apartment. Private parking. The urbanisation Alhambra del Mar is located at the Golden Mile of Marbella directly at the sea in a quiet location. The closed complex has one of the most beautiful gardens in Andalusia with idyllic streams, lily ponds and incomparable vegetation. The access to the beach promenade allows you to reach the centre of Marbella in less than 10 minutes. Numerous restaurants and shops are nearby. Bright, attractively furnished elevated ground floor apartment with beautiful, south-facing terrace frontline to the beach in "Alhambra del Mar", one of the most exclusive residential areas on Marbella's Golden Mile, within walking distance of the city centre and only a few steps away from the famous "Paseo Maritimo", the town's sea front. Elegant living/dining room with open, fully fitted kitchen.. The terrace offers beautiful views to the sea and to the beautiful tropical gardens. King size bedroom with en-suite bathroom. Air conditioning/heating in all rooms. Acepto recibir comunicaciones comerciales sobre productos o servicios.